Chattanooga Skyline at Dusk | Just Shooting Memories! Back to normal, if anything can be called normal for me. I hope to be able to make posts on time. For anyone new: on time = midnight eastern standard time. Also, don’t forget to click on the photo to see it large in Flickr. So, during our few day’s off, I was able to sneak a few hours around sunset and then late at night. I was able to make my way across the wonderful pedestrian bridge over the Tennessee River and to Coolidge Park just before sunset. I used my trusty LightTrac iPhone app to find a likely spot with the best angle. I couldn’t have planed it better. I had company. In fact there were several people and at least one other photographer in the same area I had chosen. I sat around taking photos through the magic hour and captured this just before I left. I have been to many cities in the United States, unfortunately none outside, and I must say, Chattanooga has been the most friendly. Everywhere you look at night, it is lit up. Most other cities, when you look down that alley’s from the main drag, it is dark. In Chattanooga, you can look for blocks in any direction and it is lit. There was so much here, that I will be back on a regular basis. Nice shot Daryl. I like the framing with the foreground plus the way the second bridge is framed under the first. Colors are great too. I’m sure it’s right in front of me but I can’t find where to order. I’m interested in a print of either this or the Sunset show. 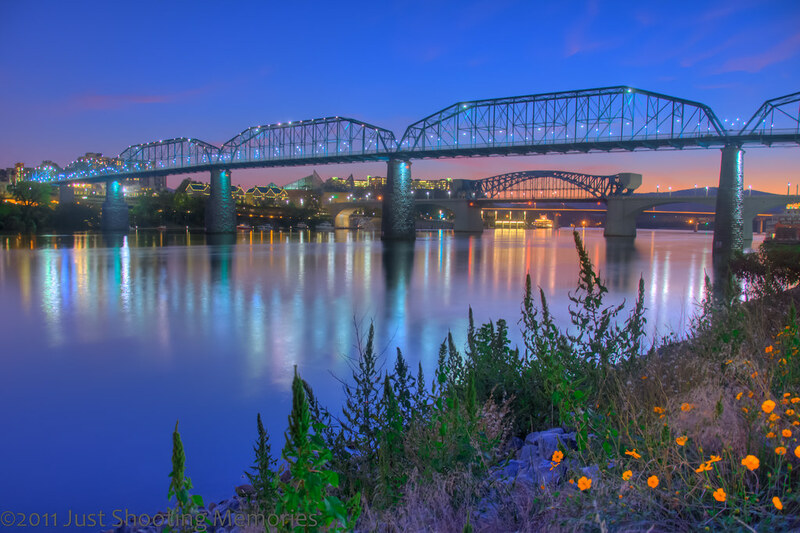 If you follow this link, Chattanooga Skyline at Dusk, you can order a print of this photo. If there is a different size you are looking for, just let me know. If there is a different photo that you would like to purchase, let me know the title and I will send you the link to purchase that one, or you can go to Just Shooting Memories on Smugmug and purchase a large majority of the photos from the site. It is not an exhaustive list, but many of them are there.